Hi there! Summer is in full swing. I wanted to just get a quick post out there for everyone before we head out for a neighbourhood bonfire in our backyard. I just love the summer. 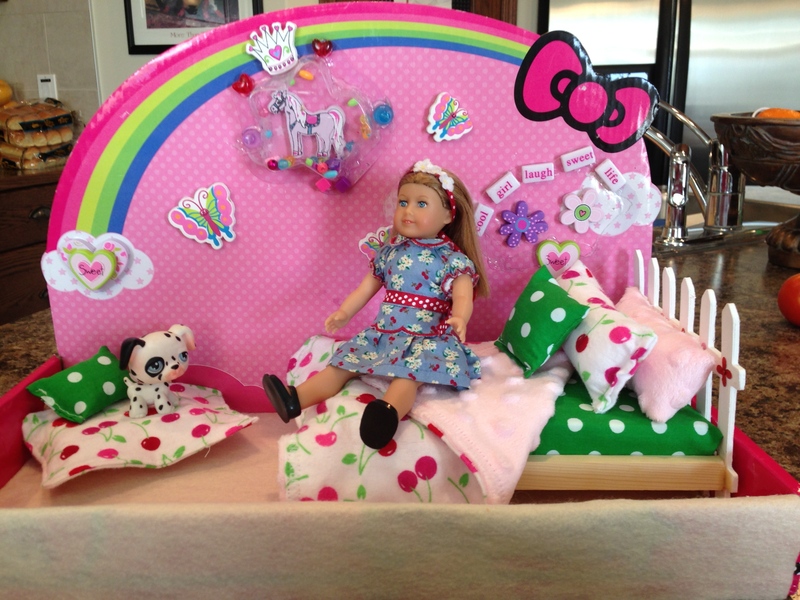 So I talked a little bit about our 6 inch American Girl dolls and you can see the uber cute beds that we made for them here. 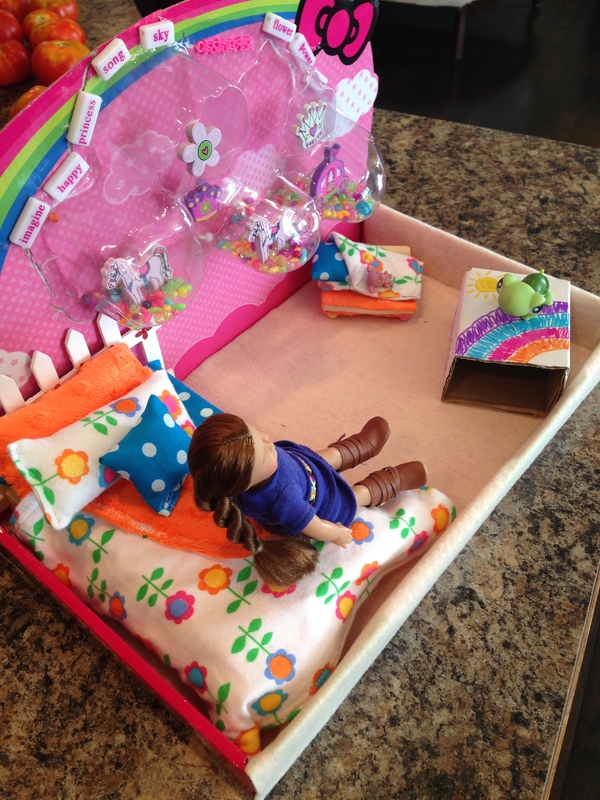 Once they had beds and matching bedding, my daughter was excited to play with them a lot more. What’s even better is that now they have a place to sleep at night. Excellent. But then, like always, my brain went into overdrive. What if the 6 inch mini dolls get lonely? What if they need some friends to hang out with? This is always what happens in my brain, especially at midnight. For other people, crafting or starting any major project is pretty much out of the question by that time. But for me, midnight always seems like the perfect time to begin crafting, especially since it is midnight and my sleep deprived brain can often best make justifications for my madness at that hour. 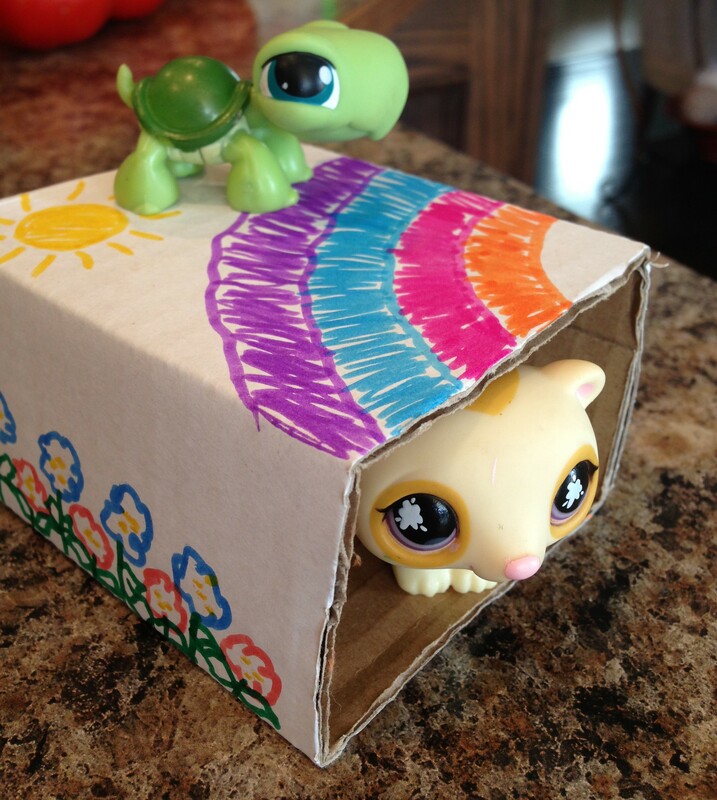 My daughter has recently become obsessed with the Littlest Pet Shop toys. I mean, really we are obsessed with all toys but she is especially obsessed with these little guys and it can’t be helped really since they are so absolutely adorable. It’s really impossible not to love them. They are purposely made with these big, darling round eyes, the kind of eyes that all babies, even baby animals, have to make them look extra helplessly adorable so that their mothers will instinctively want to take care of them. Yeah, this toy company really knows what it’s doing. 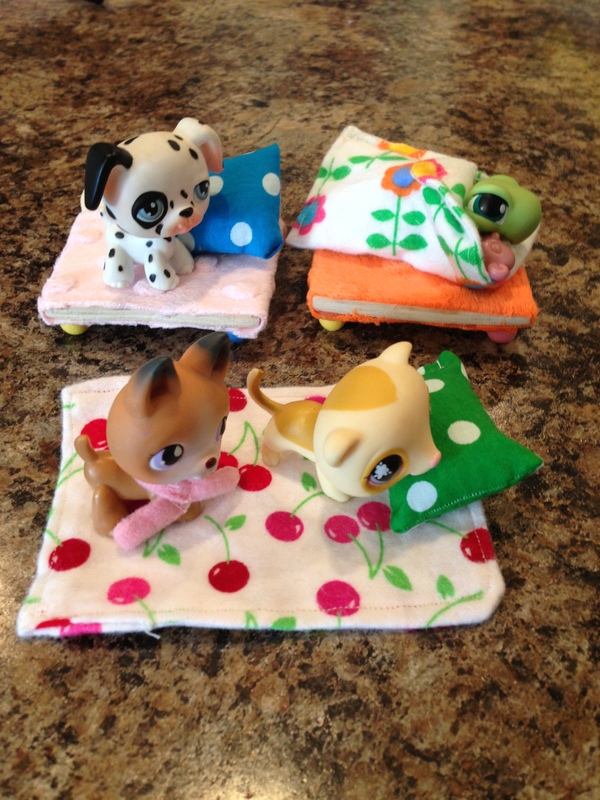 Anyway, I looked at those Littlest Pet Shops that are currently littering my living room coffee table, and then I looked at those little 6 inch American Girl mini dolls in their brand new little doll beds and suddenly I had a kind of Eureka moment. It was more of an ‘oh great, I’m about to start crafting at midnight again’ moment but you can go ahead and call it what you want. My realization was that those adorable little pet shop critters were perfectly sized to use as actual pets for the 6 inch mini dolls. That was awesome! My daughter would be so thrilled! Even better was that now the mini American Girl dolls would see even more play! Now, most people would come to that realization and probably think to themselves, how cute! They might even pat themselves on the back for making such a joyous discovery and then promptly go to bed. It was midnight after all. Not me. Begrudgingly I am never the one who promptly goes to bed. Instead I am the one up to my drooping eyeballs in glue and glitter until 4am. But that is really okay because I have found that I actually don’t need very much sleep at all to function. I don’t know what it is but I am not one of those off to bed early types. I don’t take naps in the middle of the day either. I never have. Even when my daughter was a wee tiny thing. Besides what I lack in sleep, I can always make up in coffee. That’s something else altogether. One cup of coffee in the morning will keep me wide awake until 2am and then wide awake again at 6am rip roaring and ready to start my day. I don’t know about you, but I just don’t get tired and I don’t understand it when other people around me are tired. It’s when I get too much sleep, that I’m really in trouble. I get a pounding headache and my body feels like it’s made out of silly putty. So there you have it. There is no reason for me to go to bed early. It will be 1am and everyone else will go to bed, including my husband and I will still be running around like the energizer bunny on steroids. Come on! The night is forever young! And then I start crafting. See how that works? I mean really there isn’t much else to do at 1am. Especially when no one will stay up and hang out with you. And so there I was, little pet shop critter in one hand and mini doll in the other as the gears in my head went around and around like a merry-go-round. 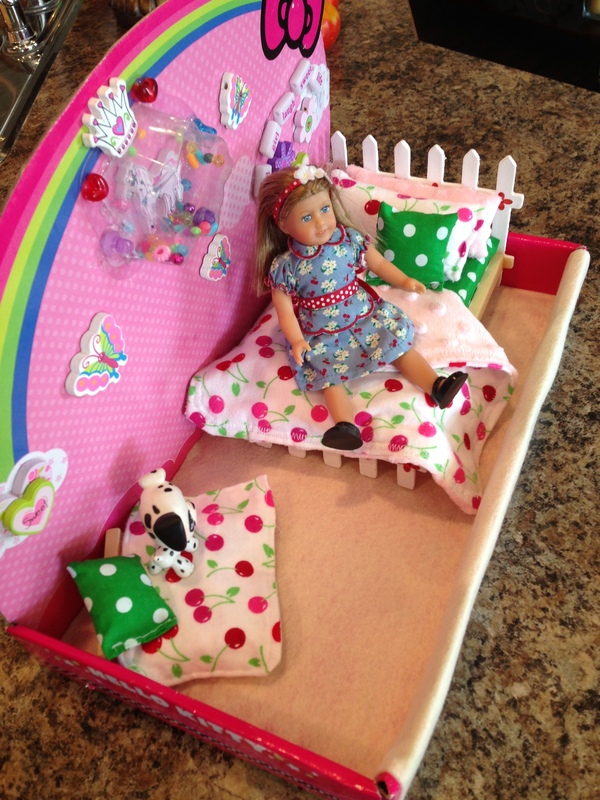 First, those little critters needed some cute bedding of their own to match the ones that their dolly friends had. 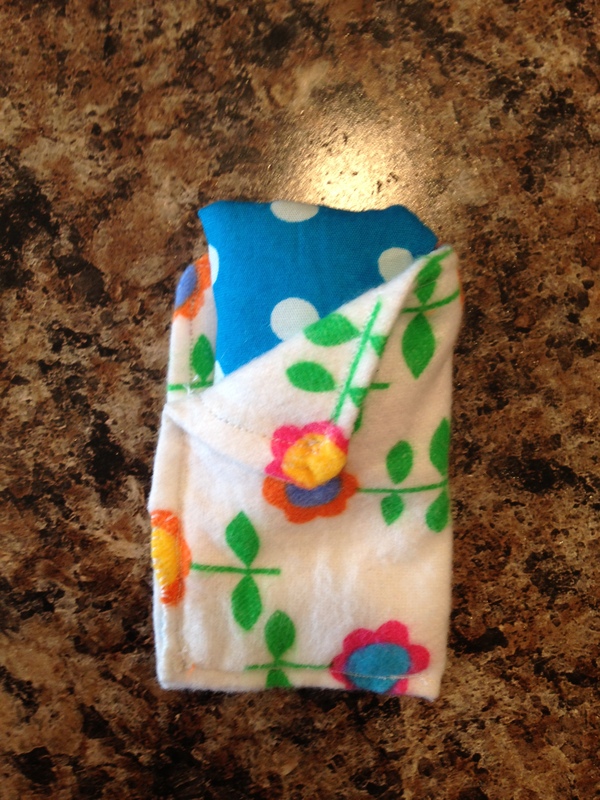 So I made some little sleeping bags. How cute! And so simple. Just take two rectangles about 3.5″ X 5″ of flannel fabric and sew it right sides together leaving an opening to flip it inside out. Flip it and sew all the way around the edges. Now if you want a blanket then you are done. If you want a sleeping bag, fold the whole thing in half and sew across the bottom and up the one side leaving enough space at the top that you can easily fit your pet inside. Turn the corner down and do a small hand stitch to keep it in place and you’re done. The pillow is just two squares of fabric stuffed with cotton. Of course, that wasn’t enough. Instead, I had to make them a little pet cage to live in and sleep in. Very cute and again very easy. I had a long rectangular box and I just cut the ends off of it. Then I drew some designs on them with marker. Easy peasy. But that wasn’t enough. I had to make them little beds to sleep on. 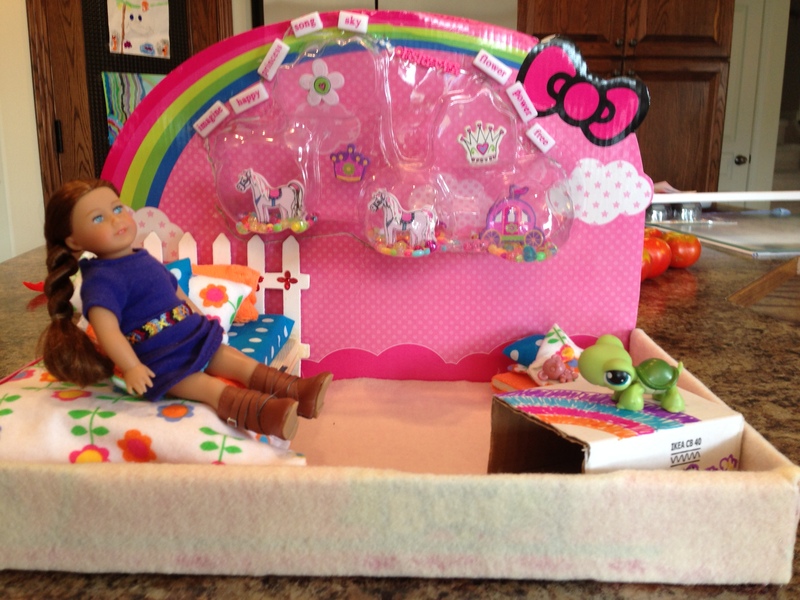 I mean, the dolls had beds so they should too right? I had some leftover recessed wood pieces from the 6 inch doll beds that we had made so I just used those as a base. Then I hot glued some minky fabric on and added some wooden beads on the bottom for feet. If you don’t have wood boards you can always use cardboard. It would probably work just as well. Then that wasn’t enough either. I really think I have a problem. I mean, other people don’t do this, do they? I finally decided that the mini American Girl dolls just had to have bedrooms to store their pets and their beds and accessories etc. I had the small dilemma of what to make them out of though. That took me almost all night and into the next day to figure out. I finally had to end up just leaving it and going to bed. Yes, I went to bed. I’m not that crazy. But the next day, after rummaging through our recycling bin, wait who am I kidding we don’t have one of those. Haha! After rummaging around in the cardboard that pretty much overflows all over my garage floor, I found the perfect solution, some cardboard packaging from another toy. It was perfect. 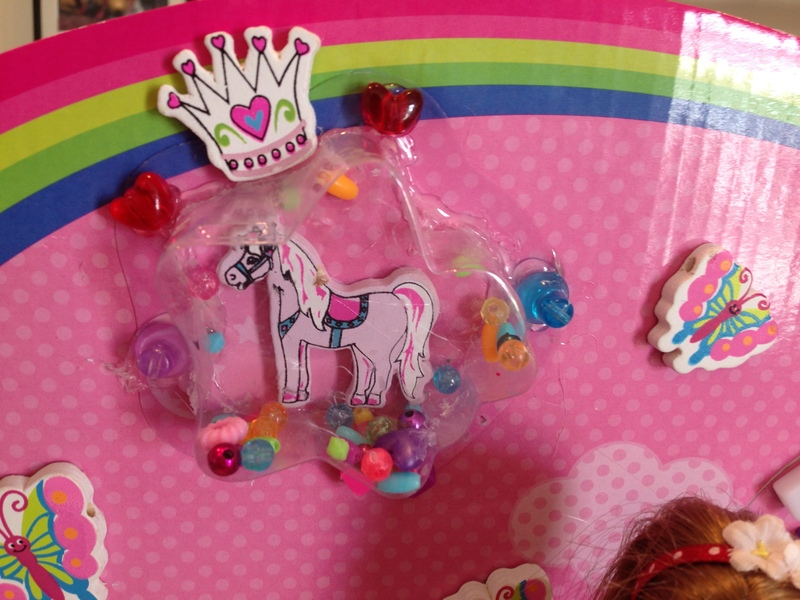 I just took the existing packaging and embellished it. 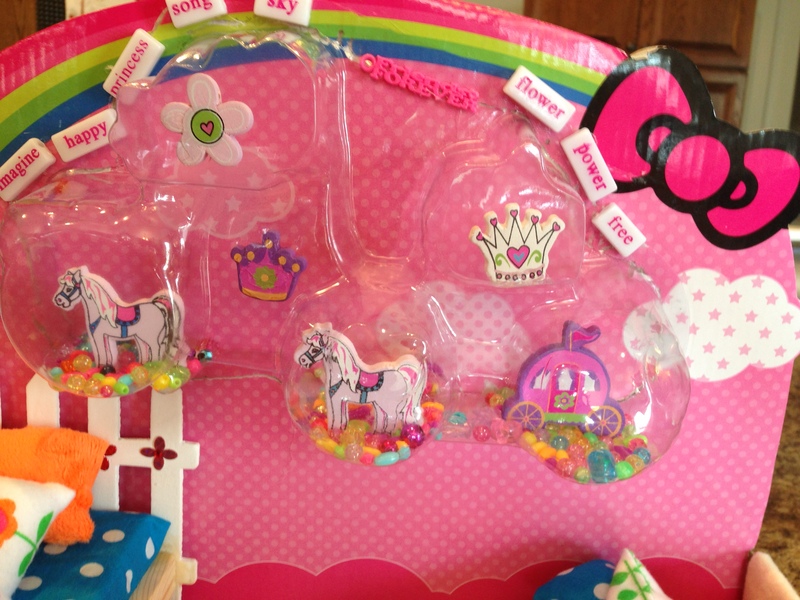 I added felt to the bottom of the boxes and filled the little plastic ‘bubble windows’ with beads and wooden ornaments. Then I embellished the ‘walls’ of the rooms with all kinds of miscellaneous craft things. 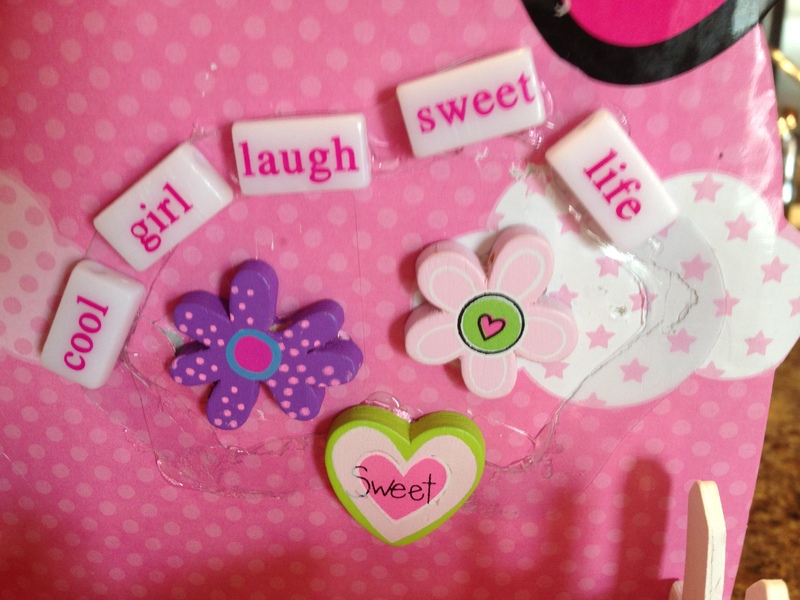 Pretty much everything girly that I could find in my house. Here are some close ups. I am terrible with a glue gun, I’m afraid so there is some glue drippage. I am not an expert by any means. Luckily, my six year old could care less about drippy glue. All she sees is sparkly stuff. Here are some pics of the pets lounging in their new homes. These are all very fun and easy crafts to make if you love mini dolls. Why don’t you try to make some too? 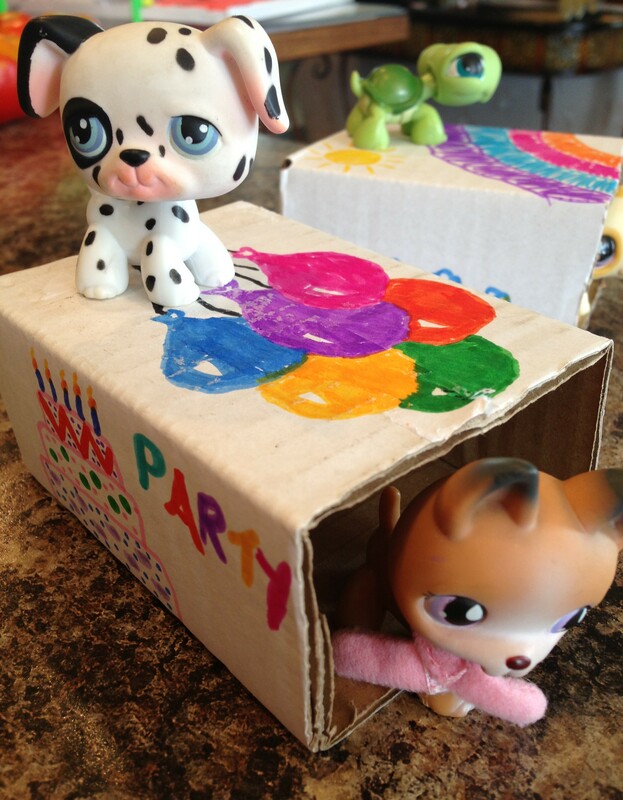 Here is a bonus craft for you and your mini dolls to enjoy. I just love making plastic jug houses. I know that I mentioned them before in this post here. There are always tons of them on Pinterest as well and the awesome girls over at Filth Wizardry make wonderful fairy houses. This cute little apartment is everything that I love about reusing things you already have around the house. You could use any jug really. The first thing that you have to do is decide where to put your door and windows. Draw them on with permanent marker and use an exacto knife and scissors to cut them out. 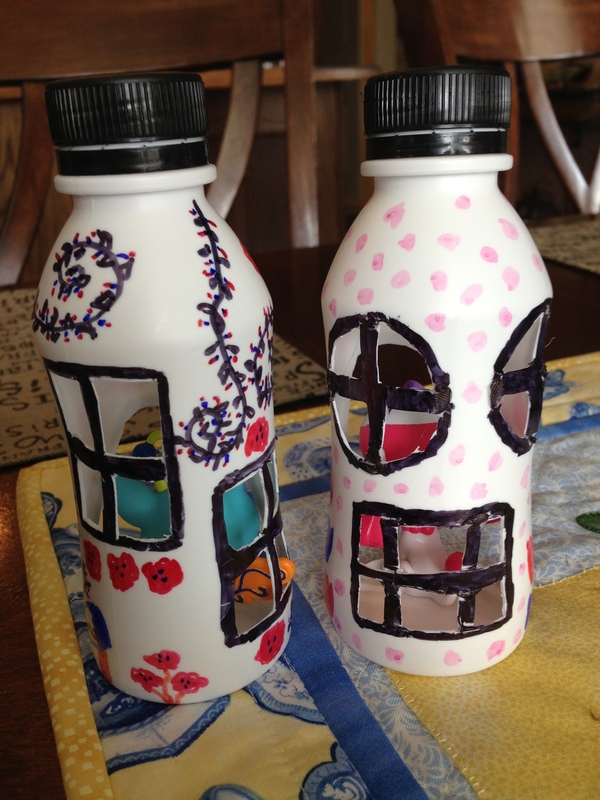 Outline the windows in permanent marker once they are cut out. 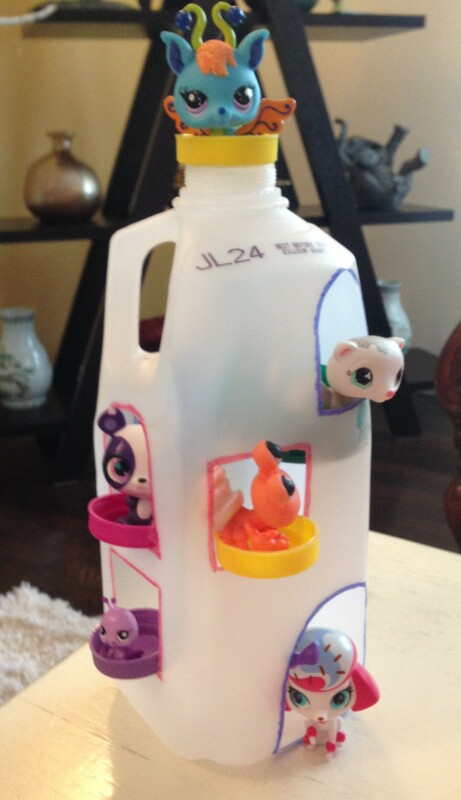 Hot glue the milk jug lids upside down halfway inside the windows as ledges for the pet shops to sit on. Use a large juice lid and glue it up inside the jug beside one of the windows so the pets can sit on it and look out the window. 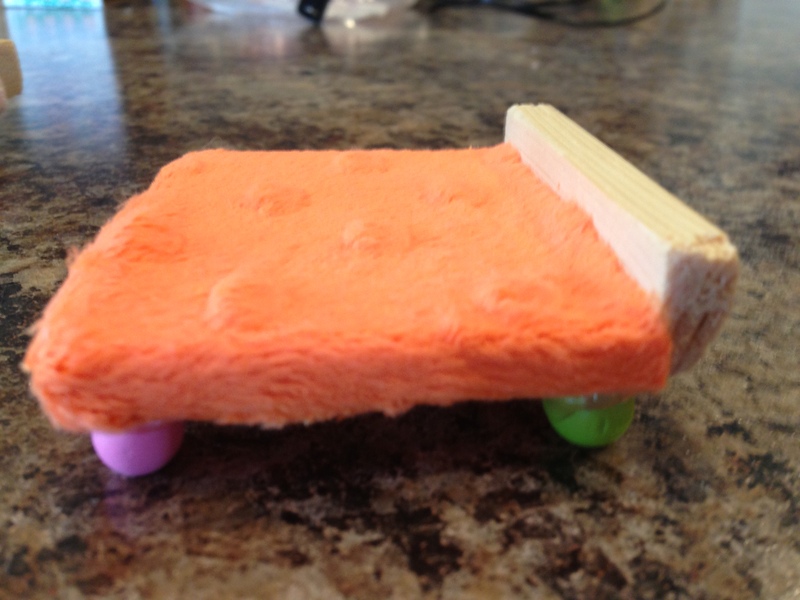 Since the juice lid is so large, it can also be used as a little loft bed for the pets. Glue another milk jug lid upside down on the top of the apartment as a lookout point. Decorate your apartment with climbing vines or flowers to make it pretty if you like. Put your critters in their new homes and enjoy!